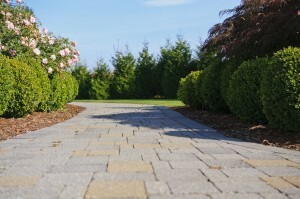 Paving Stone Care Guide | LawnPro Landscapes LTD.
A Paver patio looks beautiful when it’s new, but with a little work can stay that way for a lifetime. After a few seasons of harsh weather and backyard parties, pavers may show some signs of strain. From stains to chips, you can get your paver patio back into shape. We have provided you with simple steps to ensure the new paving stones get the proper care for your long lasting enjoyment. Cracked or Chipped PaversLawnPro Landscapes Ltd has provided you with extra paving stones when they installed your pavers. Some may have cracked or chipped and need replacing. Your pavers will most likely be set with Polymeric sand, so removal will be more difficult, but not impossible. Carefully, using a hammer and chisel, break out and remove the old paver and replace with a new one. Wetting the area first will help to soften the Polymeric sand and make removal easier. Sweep in new washed sand, Polymeric sand or have LawnPro come back for touch up. Leaf StainsDuring the fall season deciduous trees will shed their leaves potentially causing a mess of your driveway or patio. It is a good idea to clean up any fallen leaves as soon as possible so they do not stain your paving stone. Prevention is the best medicine. If leaves or grass clipping have stained your paving stone, have no fear. Take some dish soap, a stiff bristle bush and with a bit of scrubbing, the stains should disappear. For the stubborn stains, you can also purchase a stain removing solution from your local hardware store. 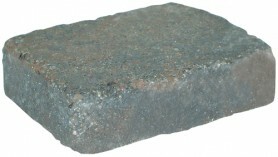 This will get your pavers back to their original appearance. Oil StainsIf you have an oil based stain, soak up as much of the stain as possible with kitty litter. Leave the kitty litter on overnight and sweep up. Use a degreasing product and a scrub brush. You can also purchase a stain removing solution from your local hardware store. If the stain is deep, it may be easier to just replace the paver. Rust StainsIf you have rust stains on your pavers use care in choosing a product or remedy. If dishwashing detergent, hot water and a stiff brush don’t remove the stain, your best bet is to go to a home improvement store and buy a product specifically made for your type of pavers. To avoid rust stains, make sure your metal patio furniture or grill feet are sealed with a rust inhibiting product. Paint StainsPaint stains can be removed with paint thinner. Apply paint thinner to the stain with a rag and carefully scrape the paint stain away. Make sure you wash the area well after you clean the stain. Regular cleaning, weeding and replacement of broken pavers will keep your patio looking as good as new. Pressure washing your paving stone can be done, but use with caution. Try to not spend too much time at the joints. The Polymeric sand will stay in its place under normal pressures, however it may work its way out with continued attention. Q. Will weeds grow from underneath? A. No, vegetation requires an appropriate amount of sunlight. Growth of vegetation occurs when airborne spores infiltrate the sand joints. If Polymeric Jointing Sand has been used on your pavers, there is minimal opportunity for the spores to infiltrate the sand joints. However, if Polymeric sand has not been used, a power washer or approved herbicide will eliminate vegetation. Any joint sand removed in the cleaning process should be replaced. Q. What is the white stuff on my pavers? A. The whitish deposit is called efflorescence. Efflorescence is a natural by-product from the cement hydration process. Calcium oxide inside the paver reacts with water in the capillaries and forms calcium hydroxide. This seeps to the surface, and reacts with the carbon dioxide in the air to form calcium carbonate, a whitish residue. When moisture on the surface evaporates, the white efflorescence becomes visible. If efflorescence is present, it will wash or wear off over the course of time. If you wish to become more aggressive in the removal of efflorescence, there are cleaners available that are designed to remove efflorescence.